Welcome to the City of Columbiana, a charter community operating with a Mayor-Council-Manager form of government.Joshua Dixon settled in 1802 and with William Heald laid out the town in 1805. 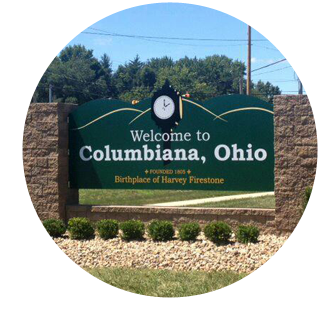 The City, formerly known as the Village of Columbiana, provides Police, Fire and EMS services. By owning and operating water, sewer and electric facilities, Columbiana is an attractive community for its expanding residential developments. Conveniently located 17 miles from Youngstown, 78 from Cleveland, 58 miles from Pittsburgh, 165 miles from Columbus and 55 miles from Akron, Columbiana offers commercial areas, an Industrial Park, manufacturing and foundries. Land and funds donated by a favorite son, Harvey S. Firestone, has grown into an approximately 68 acre beautiful Firestone Recreational Park. The Columbiana Cemetery has benefited from Harvey S. Firestone’s donation of land and their family memorial. Three golf courses in the city, two more just minutes away, and health and fitness facilities provide desired lifestyles for an active population. Browse Columbiana’s antique, craft and gift shops, enjoy one of our restaurants, see a show at the recently renovated Main Street Theater and stay overnight at the Dutch Village Inn or Columbiana Inn Bed & Breakfast. Return for the Merchants Association’s “Springtime in Columbiana” and “A Columbiana Christmas”. The nearby popular “Shaker Woods Festival” and the “Antiques and Christmas in the Woods” also draw a large crowd to our community. Plan a family or Columbiana School reunion at Street Fair time in September or during the Chamber of Commerce’s 4th of July celebration. Visit our expanding library, medical offices, churches or stop by the Columbiana Fairfield Historical Society housed at the Log Cabin on the square. Enjoy our City, “The City with the Small-Town Heart“.